READY TO MAKE CHANGES FOR YOU & YOUR FAMILY NOW? Let me share with you the proven easy way to transform your parenting! YES, SEND ME YOUR TOP TOOLS! DO YOU FEQUENTLY RESORT TO YELLING AT YOUR CHILD? Here are five simple strategies to creating greater calm and ease in your home. FEEL OVERWHELMED WHEN your child ACTS OUT? You need my FREE steps to Calm & Connected cheat sheet to put on your fridge NOW!! DO YOU WANT CLEAr, SpECIfic & SIMPLE TOOLS? WHAT IS A CHILDPROOF PARENT? TO CREATE THE FAMILY LIFE YOU DESIRE. SEVEN DAY PARENTING EMAIL cOURSE BEGINS TODAY! THIS FREE 7-DAY EMAIL COURSE WILL HELP YOU TO START BECOMING THE PARENT YOU WANT TO BE BY FOCUSING ON REGULATING YOUR EMOTIONS AND USING EMPATHY. This email course is for you if you're ready to stop yelling & nagging and start connecting using evidence-based tools and strategies. 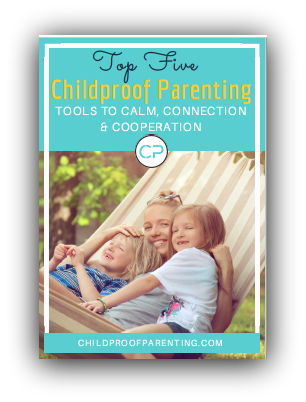 It’s the proven, easy to follow process for creating the relationship you want with your child, so you can go from chaos and confusion to confident and connected. The Childproof Parenting course is designed to help you develop a parenting plan that builds your confidence, allows for more ease and fun at home, while inviting your child's cooperation. Reflecting On The Work And Progress You've Made! Understand what makes your child do and say the things they do, so when they do that irritating THING, you respond with kindness and not react out of frustration or anger.